I keep seeing all the fab adverts for Christmas goodies in Aldi, and thought I’d take a look for myself. We stocked up well for the season and got some fun nibbles to eat in the run up to it too. 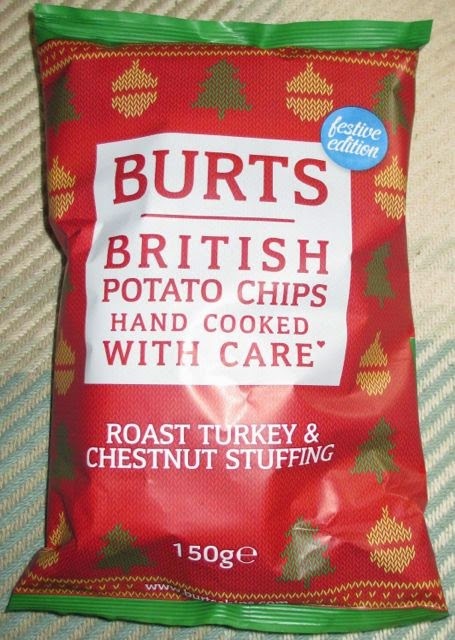 One of which were these new crisps from Burts, Turkey and Chestnut Stuffing flavour. It is sort of an obvious variety for the time of year, but I don’t think I’ve tried the flavour from Burts before. The fact that it is Turkey and Chestnut Stuffing does make me smile, and it is like a warning flag that it is almost Christmas time! These are a Limited Edition for the festive season, which makes sense. I opened up the bag and the crisps had a pleasing herby smell, not too strong and not that meaty. We shared them out and tucked in. The flavour was impressive, the main taste was that of turkey, and had a nice meaty poultry flavour, far stronger than the aroma hinted out. As I munched the herby stuffing started to shine through, and the aftertaste was very much the sage, onion and the nuttiness you associate with turkey stuffing. As someone who often opts for chicken crisps, and likes meaty flavours these were right up my street. They would be perfect for sharing with vitisors while watching a cheesy Christmas movie. They are an easy going flavour, with a good hint of Christmas themeing thrown in too.